"I think the biggest difference is the money, because you just saw $2 million spent on this congressional seat. Up until this last election, there wasn't $1 million spent by both candidates combined. So you've got $1 million to $2 million to run negative ads. That's the difference. And they work. They can drag down the best reputation. This influx of money from outside of the congressional districts is very different. It used to be, you would raise money from within your own congressional district. You would go to the people you wanted to represent and ask for their support. Today, all of the money comes from New York City or Washington. It's everywhere now. All of the targeted seats, money flows in from all over the country. There's no interest in the people of this district. They're only interested in the power that it represents." Congressman James Walsh of New York served as a Peace Corps Volunteer in Nepal in the 1960's. His office overlooking the dome of the U.S. Capitol is empty. His records and memorabilia from two decades in Congress are packed away. And he's done saying farewell to colleagues and friends. He cast his final vote in the House of Representatives at 8:46 p.m. on Dec. 10, an "aye" for the "Auto Industry Financing and Restructuring Act," a bill to provide $14 billion in loans to struggling automakers. Now as he enters his final week in office, Rep. James Walsh says he is not sure where he is headed for the next chapter of his life. But as he retires from a 20-year career in Congress, Walsh says he can look back with few regrets. The 61-year-old Republican who grew up on Syracuse's Tipperary Hill said he leaves office satisfied that his work made a difference in his hometown, nationally and internationally. During his 10 terms, he helped secure more than $900 million in federal spending for Central New York, including $160 million for the cleanup of Onondaga Lake. He wrote a bill that helped test every newborn in the nation for hearing problems. And he played a leading role in moving along the peace process in Northern Ireland. "It's as good as it gets," Walsh said as he reflected on his career. "I've told people I can't say it's beyond my wildest dreams. I never even dreamed I would come down here. It just sort of happened. I never had a grand plan, I never did." But he also leaves office frustrated that he couldn't do more for Syracuse, and that his Republican Party is on the decline nationally and across New York. His successor, Rep.-elect Dan Maffei, of DeWitt, will be the first Democrat to represent the Syracuse area in Congress in 28 years. 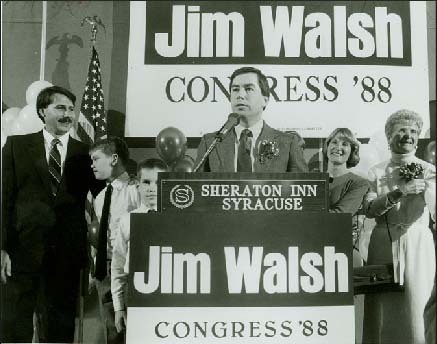 When Walsh took office in 1989, he was among 13 Republicans in the New York congressional delegation. The GOP will have only three of the state's 29 seats in the House when the new Congress is sworn in on Jan. 6. Walsh places the blame squarely on President George W. Bush, whom he supported until 2007. That's when Walsh broke ranks with his party and Bush, becoming one of only 17 GOP House members to vote against the president's "surge" in Iraq. I think the biggest difference is the money, because you just saw $2 million spent on this congressional seat. Up until this last election, there wasn't $1 million spent by both candidates combined. So you've got $1 million to $2 million to run negative ads. That's the difference. And they work. They can drag down the best reputation. This influx of money from outside of the congressional districts is very different. It used to be, you would raise money from within your own congressional district. You would go to the people you wanted to represent and ask for their support. Today, all of the money comes from New York City or Washington. It's everywhere now. All of the targeted seats, money flows in from all over the country. There's no interest in the people of this district. They're only interested in the power that it represents. It's supposed to be partisan. Here's my take: The Democrats had this place to themselves for 60 years, absent two in the 1950s. So when we got it back (with the Republican Revolution in 1994) all of a sudden it's partisan. Why? Because they're not making the decisions anymore. They hated it. The Republicans were sort of the permanent minority. To a greater extent, they just sort of went along. And after 60 years in the desert, I just don't think that they were a real vocal minority. So we won it. I mean, we had to fight to get it. You don't get to be the majority by standing on the sidelines. So we fought, and we had better ideas, and we won it. And obviously the Democrats weren't going to take that sitting down. We had our hands on all the levers of power. I thought we did really well for a while. We balanced the budget, we reformed welfare, and we passed some really good, solid congressional reforms, and cut taxes. We did all of those things. But Sept. 11 came and President Bush dramatically grew the federal government ... then two wars, a recession after Sept. 11. All of those things took us away from a balanced budget. A lot of it was not his doing, but you saw Republicans growing the government instead of downsizing it. You saw deficits growing. People didn't get that. And the war was very, very unpopular. I think the Republican Party nationally is too white, too conservative and too religious. And the Republican national party ignores New York state, except to raise money. You don't get the big-name Republicans coming through Upstate New York to build the party. So the party brand name in New York is not as strong. Not that long ago, we had four or five times as many Republican members of Congress. We had the governor's seat, we had the Syracuse mayor's seat, almost every county executive. So it hasn't been that long. I think it is really a direct reflection on President Bush and the war in Iraq, as much as anything. Primarily President Bush. He is wildly unpopular. At the beginning of the Bush administration we were a fairly strong party. But we don't have a strong party organization in New York. That has to change. We've got to do some party building, and some voter registration drives, and we need to remind people of the difference between us and Democrats. And it will be easier now, because they're in total control and they've got no one to blame. I mean the New York state candidates were blaming George Bush. In 1992 I didn't even envision being in the majority. And when it came it was unbelievable because I never expected it. And we got it, bang, I was a subcommittee chairman. All of the sudden I'm thrust into the middle of the District of Columbia's problems and I'm chairing the subcommittee. We set up the financial control board to take over D.C. And it was good. It worked beautifully. We, the Republican Party, our subcommittee, me as chairman, we straightened it out. We really turned this city around. We'll never get any credit for it. I got criticized roundly for two years while I was doing it. But it's a great city now. It really is well governed. Then I got VA HUD, which was heaven. I was term limited. I would have stayed there until I died. That was a great subcommittee -- VA, HUD, EPA, NASA, FEMA, NSF, and then a lot of other cats and dogs. I mean it was a fabulous, fabulous, subcommittee. That's when I got all of the money for Onondaga Lake, the Syracuse Neighborhood Initiative. That's when it all started. And at the same time I've got my sleeves rolled up and I'm involved in the peace process in Northern Ireland. I mean those were the heydays. They're all good days. But with the ability and the tool kit I had to work with, that was the best. Ireland, because of its significance to the world. It was such a hopeful thing. Onondaga Lake, because of its importance to my community. And it was something I came down here to do something about. It was a goal that I had. And the hearing bill (to screen newborns for hearing problems), which was an idea a constituent brought to me. And we took it from an idea to a law. And it's now affecting virtually every kid in the country. I guess I can't split them up. It's like asking me my favorite book. I love the Russians. So you have to ask me, 'Who is your favorite Russian (writer), and who is your favorite American (writer) and who is your favorite science fiction (writer)?' They're different categories. If I could have come down here, and at the end of it seen my city (Syracuse) as a sparkling, growing, vibrant place, that would have been perfect. But I realized after I came down here that it's really about New York state government. I can bring back hundreds of millions of dollars in federal resources to help, but if the overall macroeconomic climate is poor -- and it is -- it's because of New York state governance. It's not because of federal governance. So in the sense that I couldn't make (Syracuse) the next Austin, Texas, it was beyond my ability. I did what I could. I think that Syracuse in the last 10 years has fared better than Rochester and Buffalo. Maybe not as well as Albany, but Albany is the state capital and the legislators look out the window and they see it. But I think Syracuse has done better than pretty much any other place Upstate, other than Albany. We had a lot to do with that, especially in the city itself, in downtown and the neighborhoods and the lake, and the hope that a clean lake brings. I think we planted the seeds. At the end of this economic downturn Syracuse is very well positioned to take off. We'll never have explosive growth, but I think we've weathered the storm. Well, I'm not dead yet. I have more to contribute. I feel energetic, and still curious, and anxious to get to the next chapter, whatever that is. I have had a wonderful, wonderful life. As I said in my outgoing statement, I had a great youth, a great family, the lake in the summertime, a great college experience ... the Peace Corps, a wonderful, beautiful wife, great kids and this (he stares out his window at the Capitol Dome). It's as good as it gets. 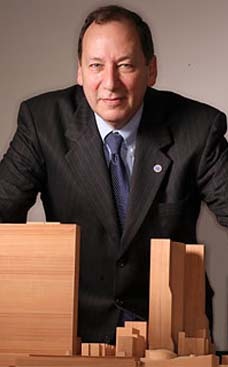 Washington bureau reporter Mark Weiner can be reached at mweiner@syracuse.com or 571-970-3751. New: More Stories from October and November 2008.